Ask fellow campers about "Cape Henlopen State Park" and nearby attractions. This is a nice state park with paved interior roads & paved unit pads. Pay close attention to the site you book as some site pads are very short. No sewer is available. There are multiple friendly camp hosts keeping things cleaned up. Restrooms/showers are individual rooms. This is a very sandy campground. There are many biking trails. The fort was closed during our visit. There is a small campstore. Most people would need to bike or go by car to the beach. Our hookups were good. We received many OTA TV stations & our Verizon hotspot worked well. We would stay again. 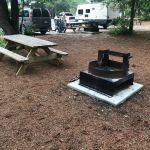 We camped at Cape Henlopen State Park in a Travel Trailer. Ask for a park map & campground map so you can tell the distance from the campground to other areas of interest within the park. We stayed at this state park campground for 5 nights, Sunday-Friday in August. There are pull-thru and back-in sites in this campground. Check the campground map and reserve early to get the right site for you and your rig. The campground is a quiet family campground and stays full and busy; it is clean and well managed. Staff is friendly and helpful. The campground lies within Cape Henlopen State Park which is large and has lots of activities. There is a historical fort, a nature center, playground, beaches, walking/biking trails, and observation towers. We usually tow a car with our RV but didn't bring one this time. We were able to ride our bikes wherever we wanted. We rode bikes to catch the ferry and went over to Cape May; we rode bikes to Rehoboth Beach; we rode bikes to the historical town of Lewes; we rode bikes to 4 different beaches, and we also rode all of the trails in the park. We camped at Cape Henlopen State Park in a Motorhome. There are pull-thru and back-in sites in this campground. Check the campground map and reserve early to get the right site for you and your rig. One of the nicest parks for beaches, crabbing, fishing, walking, bird watching, photography and bicycle riding. Site size vary from tight to spacious pull throughs. Our motorhome was in a tight site while a single woman in her tent was in a pull through. We reserved our site 6 months in advance and at that time we only had a few to choose from. You reserve the exact site you want up to a year in advance. We camped at Cape Henlopen State Park in a Motorhome. Wow, this is an awesome State Park and campground! We can't wait to come back and stay longer! The sites are pretty close to each other but we did not mind because everything else makes up for it. Miles of biking trails! You can even ride all the way to nearby Lewes or Bethany Beach from the campground. There is beach access within the Park with bathrooms and concession stand. We rode our bikes to the beach! There is a WWII camp in the park as well and we enjoyed climbing the look out tower. Roads are paved in the campground and the sites are mostly sand. Sites shaded. Very nice laundry facilities. Clean, newer bathrooms that are all individual units with a sink, toilet, and shower. Camp store that sells firewood. There is a nice nature center with a touch tank. Many trails to hike. Nice playgrounds throughout the park. No sewer at the sites but they all have electric and water. 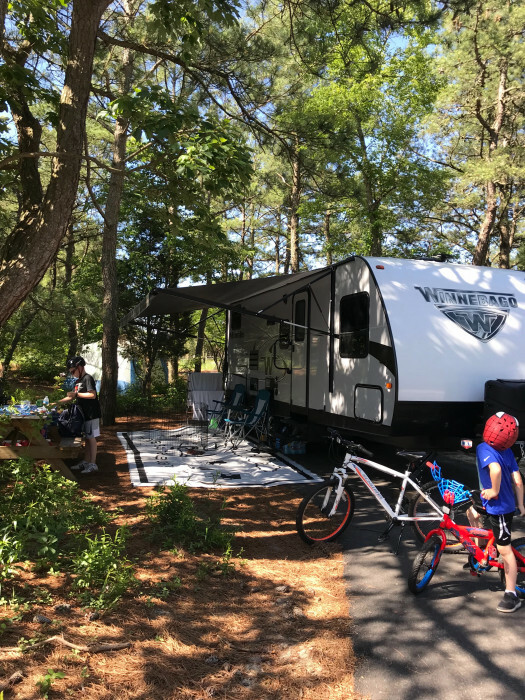 We camped at Cape Henlopen State Park in a Travel Trailer. Near by Lewes is very charming with good restaurants! You can also take your camper on the Lewes Ferry over to Cape May, NJ! Park is brand new in that all the sites have new pads, new fire grills, water & 50 amp hookups. Alas sites vary in size starting at only 15ft. Very few are long pull-thru sites. That said, many of the 35ft. sites can still fit 45ft. coaches. But not all. Not enough to call this a big rig friendly park. Our site was not level, front tires lifted off the ground to be level. Dog friendly beach is 30 minutes walk, much easier to drive to it. Closest grocery store is 15 minutes away back on Route 1. We camped at Cape Henlopen State Park in a Motorhome. Historic Lewes is very charming. 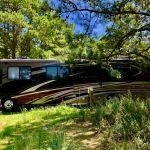 We still prefer DE Seashore State Park which is right next to the beach and every site is big rig friendly and full hookups. We needed a quick overnight escape and really like this park, especially in the off-season. There were plenty of sites available for our 21' camper van, all level with new asphalt and fire ring & picnic table. Since we had not de-winterized we hooked to power only; water was also available at our site. Great walking/hiking trails as well as an expansive beach. We explored the Great Dune and felt like we were in another world! The campground was extremely peaceful and quiet this time of year, but I imagine it is packed during the summer months, when it would be a great family destination. Some of the sites are small so be sure to check the size if reserving online. We camped at Cape Henlopen State Park in a Motorhome. 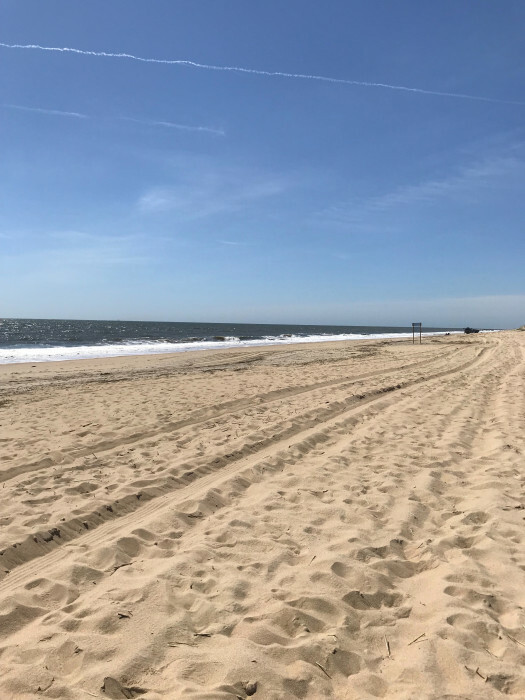 There is so much to do within the park that there is no need to travel outside it, however it is very close to the quaint historic town of Lewes and only several miles to Rehoboth Beach. Restaurants and stores are abundant in the area. Space E9 was perfect for my 30 foot Coach. Great bike trails in park that connect to paths leading to Rehobeth Beach. 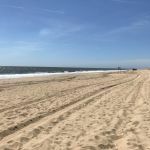 Great access to Cape Henlopen Beach and short bike ride to Lewes-Cape May ferry. The weather was windy so the waves and rip currents were strong in ocean side. I love this campground and I will be using it again in the near future. We camped at Cape Henlopen State Park in a Motorhome. Great seafood restaurants in Lewes, Rehoboth Beach, and Dewey Beach. Outlet shopping is ten minute drive away. Our site was level and mostly clear of sand on the pad. Had to do a little work to get my camper back all the way in. The store was nice. Location to the beach was a short car or bike ride. The only 2 things we found wrong, our fire ring was on the back side of the camper. The bathhouse was new and as clean as be with all the sand. The only thing about the bathhouse was there was no rooms with just a bathroom. (each room has a shower, sink and toilet.) So the line can be long to just use the bathroom. This does not bother campers with their own bathroom. We would stay at this park again and recommend it to others. We camped at Cape Henlopen State Park in a Travel Trailer. If you are looking for a place to stay with access to the beach on the ocean, or the bay, this is for you. The unguarded beach is also pet friendly. Park has recently been renovated with new pads..heed to the listed lengths of the sites because some are only big enough for pop ups. 20,30,and 50 amp available. I have an EMS device and never saw the voltage drop under 120, and many people had their ACs on. (3) stations at the dump site. We camped at Cape Henlopen State Park in a Travel Trailer. If you need to venture out to the shopping area, do it early as this route 1 & 9 gets real congested with vacation traffic during this time of year. Don't under estimate length of your rig when reserving as some pads are real short. Also, be prepared for your picnic table / fire ring to be behind your rig...if reserving for a tent, you are better off selecting a "tent only" site as they provide a more level site than the rv sites. First stay here after remodel of campground. They did a very good job redesigning to accommodate those of us in travel trailers. Many pull throughs for larger units. Many sites have very short driveways that hold only a vehicle, pop up or tear drop. Overall a nice mix of sizes for the sites. There is a couple of tent only areas. The park has great beaches on both the ocean and the bay. Miles of Bike trails one will lead you into Rehoboth Beach to avoid traffic. We camped at Cape Henlopen State Park in a Travel Trailer. Fort Miles which is inside the park is a WW2 site. They have events with folks in period costume. Also can tour a WW2 battery. Close to shopping, dining and boardwalk. This park is amazing. The bicycle trails are just fabulous. You can pedal all the way to Rehoboth or Lewes. The Miles historic area is cool and has tons of presentations. The beach is nice with lots of guards. But the RV campsites are a bit strange. There are a few very nice pull through sites, a few nice back ins, and a whole lot of tiny back ins. We'll go back as long as we can get a nice site. We camped at Cape Henlopen State Park in a Travel Trailer. When reserving make sure to look at the site length. Don't just use the length of your trailer or you may need to park in overflow. There are a bunch of 15-20' long sites that the parking pad is only that long and then the site drops off. The recent renovations are done, and now all sites, except tent sites have electric and water hook-ups. However, with the renovations the feel of the campground has changed so much. And not for the better. It now resembles a commercial campground with many very small lots. We used to camp in the area that is now F loop because it was quiet and peaceful. Now it's busy and packed with parking lots, fences and too many close by neighbors. We camped at Cape Henlopen State Park in a Motorhome. We camped here about five years ago and liked it but since then the cost of staying at a Delaware State Park without hookups ($38) is unreal especially for an out of state camper. 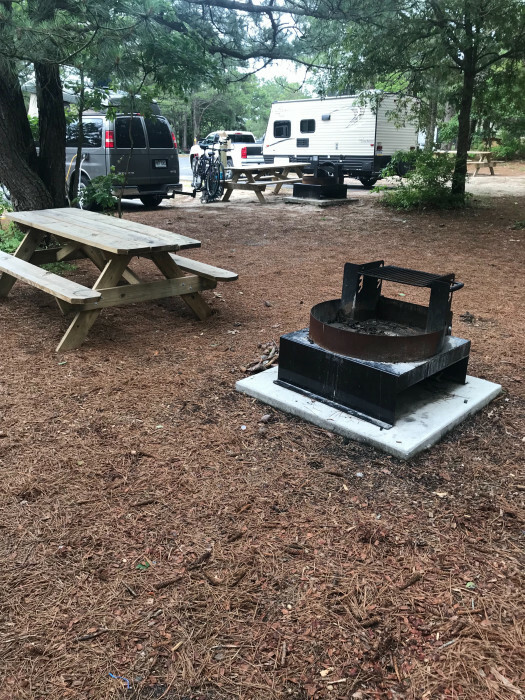 Considering that the parking RV sites are all on the loop roads with one's picnic table, fire pit and tenting sites in the woods next to it. Most sites have water but no other hookups. We stayed one night and only one bathroom was open but the campground closed down the next day so that they could bring in modular bathhouses to update the other three. Our bathhouse was clean, had showers but old and needed updating. 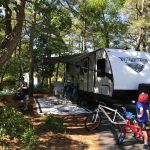 What this campground has going for it is location, bike trails, beaches, great friendly check in hosts and it is near the Cape May Ferry. Some great bike trails! The loop roads need to be repaved most of them are buckling and it is hard to get an RV level. We would not stay here again except for taking the Cape May Ferry! We camped at Cape Henlopen State Park in a Motorhome. Great location not my favorite campground but a lot to do in the area. Great stay to take the Cape May ferry the next morning. This park is very near the Lewes-Cape May ferry. Lovely, peaceful campground. No hookups except water. No generators--hooray. Dump station. Parking is parallel on the blacktop street next to sandy shaded sites. Spacious sites have picnic tables and fire pits. The park was an Army base during WW2 and there are many historical sites to tour including barracks, bunkers, and towers overlooking the Atlantic Ocean. Well-marked trails and bike paths.Robust single stream recycling. Off season registration is unbelievably stupid, dysfunctional and illogical. We watched carefully for registration signs as we entered the park, did see an office building on the right, but no registration signs. Pulled straight ahead to a manned building on the entrance road. The person there instructed us to go past the building, then make 3 left turns which took us to the front of the office building, no place to park a rig, and no signs. A staff person walking by motioned to make two right turns--then there was a place to park and walk to the entrance of the office building where we were told that we must first visit the campground and choose a site, then return to office to register. Registration process took 45 minutes. 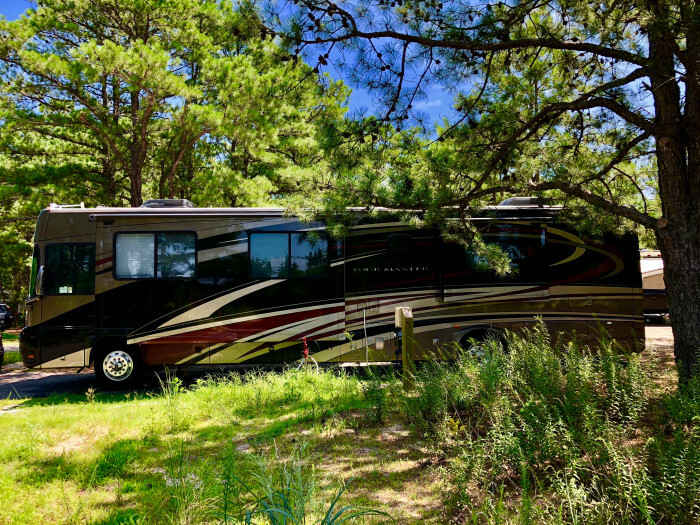 We camped at Cape Henlopen State Park in a Fifth Wheel. Are you affiliated with Cape Henlopen State Park ?